Inner case dimensions are -Double Decker Size(cm)-LxBxH- 22x14x18. Ziper Closure. Jewellery pouch is an exclusive Premium quality bags which have Elegance, Style, Fashion and Comfort- all rolled into one. This latest Short Multifunctional Cosmetics Storage is made of a smooth Glossy finish. 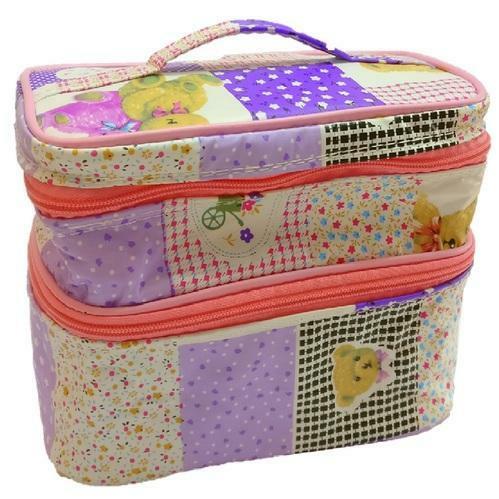 The Professional Cosmetic Bag with its attached storage organizer bag. The Bag has with 2 compartments including Can be used for keeping jewelry in Bank lockers. Incorporated in the year 2015, at Kolkata, (West Bengal, India), we “ADDYZ”, are a Sole Proprietorship Firm, and renowned Manufacturer and Exporter of the finest quality Jewelry Boxes, Wardrobe Accessories, Single Bed Sheet, Saree Covers And Bags, Blouse Covers, Packing Bags, Cosmetic Kits, Bed Sheet Cover Bags and Wooden Mortar. Under the guidance of our Mentor “Rajaram Jhawar (Manager)”, we have reached on top position in the industry. We export these products to USA, UK, Australia, Singapore, Dubai, UAE and Saudi Arabia.